Travertine is a complimentary item to GeoStone Retaining Walls and therefore not available in certain areas. Availability of colors in coping, patterns, and sizes varies. Travertine is a natural stone that is in the marble family. It's variations in color are called "movement" so when you see a color like Ivory that has a more conservative look, it would have little movement. Colors like Gold and Autumn Leaves have a lot of movement. This movement is caused by minerals in the ground. Different veins have a higher concentration of minerals. Travertine, as with any other natural stone product can vary in color and must be ordered all at once to increase the similarity in color. Travertine by nature has more of a matte finish and not slippery when wet as is with marble. Travertine is also cool to the touch and the perfect product for pool decks. Surprisingly, Travertine is around 13000 psi. That is almost double the compressive strength of a commercial concrete paver! All Travertine is pitted. This is what gives the product character. Some Travertine is more pitted than others. 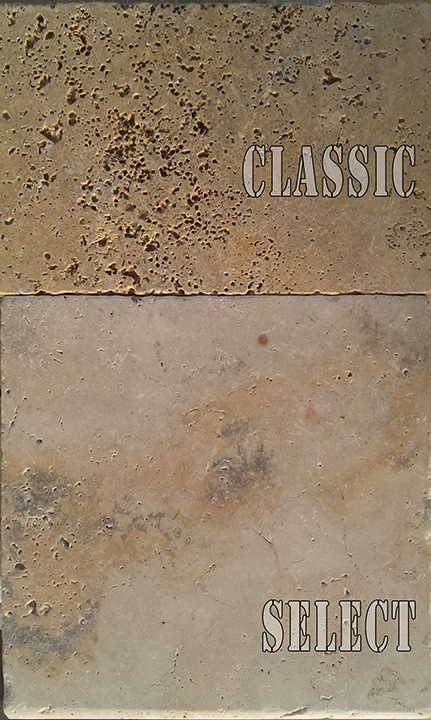 Heavily pitted is referred to as "Classic" and represents the majority of Travertine sold. GeoStone only carries what is referred to as "Select" or minimally pitted Travertine. This is a much higher quality stone and therefore the most sought after.